This is the Grease Rag RIDE & Wrench, right? So let’s ride! Group ride meets at 6pm on the Greenway at 11th Ave, at the bottom of the ramp, just east of Freewheel Midtown. (Here.) Roll out at 6:10 to Sunrise Cyclery. This ride is on the 1st and 3rd Thursdays of the month, before Grease Rag in Uptown. Before we take off we will do a quick overview of group riding skills. 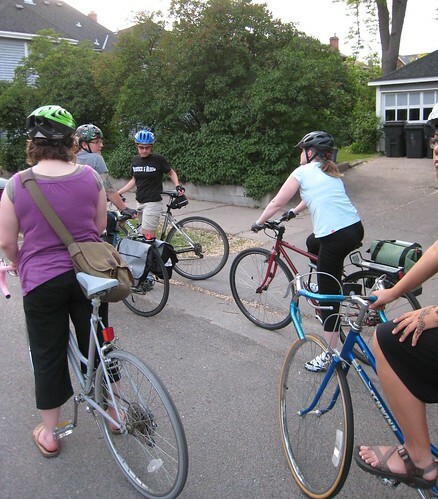 The purpose of this ride is to practice riding in a group and to get to know each other. It will be a casual (slow, no-drop) ride suitable for everyone. We will be on paved roads and trails the entire ride. The group ride ends up at Sunrise Cyclery (901 W Lake St) at 7 for wrenching. If you have questions… just ask! I am super excited to lead this ride. It should be really nice weather tomorrow, so come on out. Crap… I’m horrible at directions and don’t know which way is south. Haha- I’m glad you could still meet up with the ride! Hi Margie! We’d love to have you join us. The rides have been really fun. We have been meeting at the S. end of the Stone Arch Bridge at 6pm before Grease Rag, which is the 1st and 3rd Thursdays. I’m excited to learn about this group, which I read about in the Metro Magazine. Is there someone who coordinates things for the group? Are there always some people meeting at the West River Rd and Greenway? I’m only a novice rider; hope that is okay. Is Grease Rag in Metro Magazine? Wild. The group ride this year is meeting at W. River Rd. and the Greenway, at the bottom of the ramp, next to the bench with the shoe sculpture on them. We ride at 6:10 every 1st and 3rd Thursday. Our ride is aimed at whoever comes- we won’t leave you behind! If you need to contact GR for any other questions you might have, greaseragmpls at gmail is where you’ll find us. Does the Group Ride need to sign up before joining it? Or just meet there directly. Then, how can I recognize you at the first time ? Thank you!! Helga, our new website is greaserag.org. This website is no longer updated. You do not need to sign up for the group ride, just show up to the meeting spot. You will recognize us- we will be the bunch of WTFs on bikes!